Twice a year, the WordStream team chooses a location and packs their bags to travel to one of the many Google offices in the U.S. for WordStream Live, a one-day symposium that brings our award-winning paid search expertise to the main stage. The topics of these presentations vary each time, but the goal is always the same: to provide marketers with actionable insights they can employ right away. The most recent WordStream Live event took place in Chicago at Google’s West Loop campus amidst sprawling downtown views, funky coffee shops, and deep-dish spots (and you bet we had a slice or two). Here’s a full recap of what went down at WordStream Live this fall – and who knows, maybe you’ll join us at the next one! Senior Customer Marketing Specialist Jess Armstrong acted as WordStream Live MC. WordStream’s CEO Howard Kogan and SVP of Product Kristen Yerardi. Stacey McKibbin, COO of R3, was the Google keynote speaker. McKibbin took a deep dive into the micro-moments that define intent in a consumer. She shared that, on average, mobile users check their phones around 150 times per day, and 62% of smartphone users are more likely to take action right away because of smartphones. As advertisers, we want to be present when our customers are searching for us. But McKibbin challenged us to consider whether we want to be in the way as they search, or be part of our customers accomplishing something. Our Customer Success leaders Zina Kayyali and Phil Kowalski then shared some proprietary data about what makes the top 25 accounts in WordStream so successful. (Hint: Walt Disney’s formula for success and the K.I.S.S. model.) They also showed photos of very cute puppies, which makes any presentation that much more successful in my book. Did I mention food yet? Weird, as it’s all I can think about since the event. I specifically seek out trips to Chicago to get my hands on a Chicago-style hot dog (not kidding). Who can resist those pickle spears?! Lucky for me, I didn’t have to miss out on any panels or presentations to run outside and find the nearest cart. Lunch was delicious dogs with all of the fixings, and I’m just saying I may have had more than one. Or two. Breakout time! WordStream clients include individual advertisers as well as marketing agencies. To make sure that we provided (remember?) each of these marketers with actionable insights they could employ right away, our customer success teams shared insights for both marketing agencies and individual advertisers in breakout sessions. Agency morning and afternoon sessions included a walk-through of the prospective tools to help make agencies and their clients more profitable and scalable tips for more efficient client management. For advertiser-specific sessions, WordStream experts discussed best practices for driving growth in local markets and the difference between striving for general quality in your campaigns versus chasing a high Quality Score. Another breakout presentation explored how the conversational style of search is changing and shared actions to take in order to not be left behind as we increasingly move towards a mobile-centric and voice-search-heavy landscape of digital marketing. Jess Armstrong, right, leading a customer panel. Our Keynote of the day was from WordStream Senior Data Scientist Mark Irvine, who was voted one of the top 15 most influential PPC experts every year for the last 4 years. Here at WordStream, Mark analyzes the data trends of over 22,000 clients. For his presentation, Mark used insights from this data to share how to better have your paid search and social work together to complete the advertising journey to ensure digital advertising success. Mark Irvine, senior data scientist, presenting at WordStream Live. The day ended with some wrap-ups: a prize for the longest WordStream customer in attendance, a raffle, and the winner of the day’s tweet-off was announced. The winner, a marketer out of Milwaukee, tweeted using the hashtag #WordStreamLive a total of 161 times! That’s a wrap on WordStream Live! Props to all of our presenters and to our hosts at Google. And, of course, a big thank you to all of our attendees! Mikayla is our social and community engagement specialist at WordStream (follow us!). Her interests include jammy red wine and trying to find the best breakfast taco in town. She recently ran her first half marathon and is scouting locations for her second in the spring. 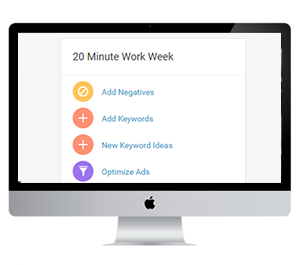 Improve your PPC in just 20 minutes a week.